Fungi could soon be helping beekeepers control a parasitic mite that before now has killed up to 70% of colonies.Research shows that the fungi can kill Varroajust as effectively as the chemicals currently used to keep populations of the parasite manageable. The fungi could prove key to protecting hives as the mites become resistant to chemical controls currently used to treat them. But it could be some years before beekeepers can buy the fungal controls off the shelf for use in hives. 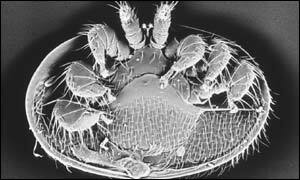 The Varroa destructor mite was first found in the UK in 1992 and has wrought havoc on feral and hive populations. Some beekeepers lost almost 75% of their colonies to the mite that preys on young bees weakening them, and making them susceptible to other infections. Pesticides have helped keep the mites populations at low levels but some fear that colonies are about to undergo another wave of devastation as mites become resistant to the pyrethroids used to kill them. Overuse of the chemicals has produced populations of resistant mites in hives in the South West of England and the resilient strain is expected to spread across the country. But research carried out by Dr David Chandler and Dr Gill Davidson at the Horticulture Research International Association in Warwickshire has found that insect-killing fungi could take over the job of controlling the mites. "Fungal controls have a long history since Pasteur," said Dr Chandler, "but interest is increasing because of public concern over the environmental impact of pesticide residues in food." By contrast with chemical pesticides the fungi tested by the scientists are found in nature, are harmless to mammals, including humans, and leave no residue to accumulate in food. Testing by the researchers has identified more than 40 types of fungi from six species that are capable of killing theVarroa mites within 100 hours. "Using living organisms to control other living organisms is a different form of pest control," said Dr Chandler. "Chemicals are very efficient and cheap but the downside is that their use is not sustainable in the long term." 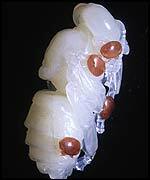 Although the fungi occur naturally the mites rarely encountered them inside hives because honeybees kept their homes so clean, he said. The promising fungal types are now being tested to ensure they are as effective in the high temperatures and humidity levels found in bee hives. Dr Chandler said the aim was not to eliminate the Varroa mite, but to ensure that populations were kept to very low levels. The fact that the fungal controls killsVarroa by different methods could mean that the mites never develop the kind of resistance that is making pesticides less effective. 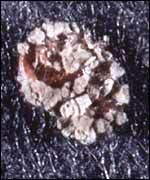 The fungi spores kill the mites over a week long period by penetrating their cuticle and poisoning the bug, drying it out and damaging its cells and organs. The two researchers are now embarking on a three-year project with the IACR-Bee Research Unit in Rothamstead to identify the best strains of fungi and find the best way to distribute them around a hive. Dr Chandler said that honey bees were already used to spread fungi on some commercial crops so it might prove easy to adapt these methods to spread the anti-Varroafungi inside hives. One idea is to use a fungi footbath that bees have to walk through when entering the hive to help them spread the spores around when they deliver nectar and pollen.